Well, that saga is over, and it's not a head coaching job that Jesse Marsch left Metro for. 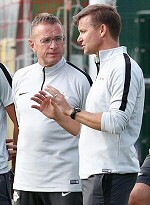 Instead, he signed a two-year contract to become an assistant coach at RB Leipzig. The first year will be under Ralf Rangnick, who will also split time as Red Bull's global sporting director. Julian Nagelsman is supposed to take over for the next season. "We have worked together for a long time now and now we have found the best solution to continue on our successful path," Leipzig CEO Oliver Mintzlaff said.